Americans treasure the good things in our lives: freedom, fresh air, clean water, and safe food. 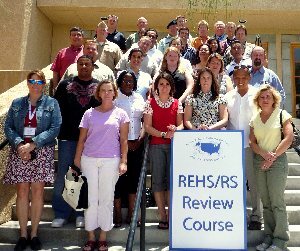 But so few Americans know that a small group of dedicated professionals known as Registered Environmental Health Specialists (REHS) and Registered Sanitarians (RS) work quietly and diligently to protect those basic elements of a healthy environment. This website is devoted to helping those dedicated few achieve the professional credentials, certifications, and licenses necessary to validate their abilities and understanding of the science behind the environmental issues. 3. We offer customized text books to Universities to either use in E.H. introductory courses or as a final review reference book to prepare students to take the NEHA REHS/RS Exam.